I’m married to Mister Fourth of July. Although born in June, Joe loves the fourth. I suspect he might even have a calendar hidden away somewhere to tick off the days leading up to this glorious holiday the way our kids count down to Santa. Since we moved to New Hampshire five years ago, we’ve watched the fireworks display on July 3rd, and followed it up with a festive parade on the morning of the 4th. For these events, Joe likes us to have matching red, white, and blue clothes and a patriotic attitude. I laughed so hard I almost fell out of the window. And for the past 365 days, I’ve seized every single opportunity available to spit that phrase back at him. “How are the burgers?” Good, not great. “Did you like that movie?” Good, not great. “How does the grass look?” Good, not great. I’m proud to say I pulled it together for America’s birthday this year. The kids all had matching navy outfits and come 5:00 on Tuesday evening, I was searching the clearance racks in Macy’s for something navy or red for myself. For $7.99 I found a dark blue t-shirt at Bob’s Deep Discount and felt victorious. And so, late in the evening on Tuesday July 3rd, we trooped over to Amherst, New Hampshire to take in the fireworks. I’ll admit it; I’m a bit of a curmudgeon for this event. You see, I have a little bit of autism myself. I hate crowds and I hate noise. I don’t like standing in lines and I don’t like hotdogs for dinner. And I hate mosquitoes. I may have complained once or twice about these things. Usually we bring only the older boys because Rose and Henry were little for such a late night. This year Joe convinced me that they were ready for their first show of fireworks. I wasn’t as confident, and sure enough, as soon as the first one went off Henry started to shriek. (Still traumatized by Disney, he was scared it was more wightning.) “So glad you talked me into this!” I sneered spitefully. Unfazed, Joe pulled a giant pair of headphones out of the bag he’d brought. Voila! The night was saved. Then I watched him gather Rose and Henry on his lap, the very same way he did three years ago when our autistic son, Jack, could not tolerate the booming sound. Patiently, he explained how the noise is very far away, and to watch carefully for the beautiful explosion of light and color. Wednesday morning he woke up in usual Fourth of July fashion, which is to say he skipped out of bed and bounded around the house like a nut. The forecast predicted rain and he diligently studied the radar on his phone and decided, yes, yes the parade would go on. He called his parents to confirm their attendance, and then he went downstairs to make star-shaped pancakes. 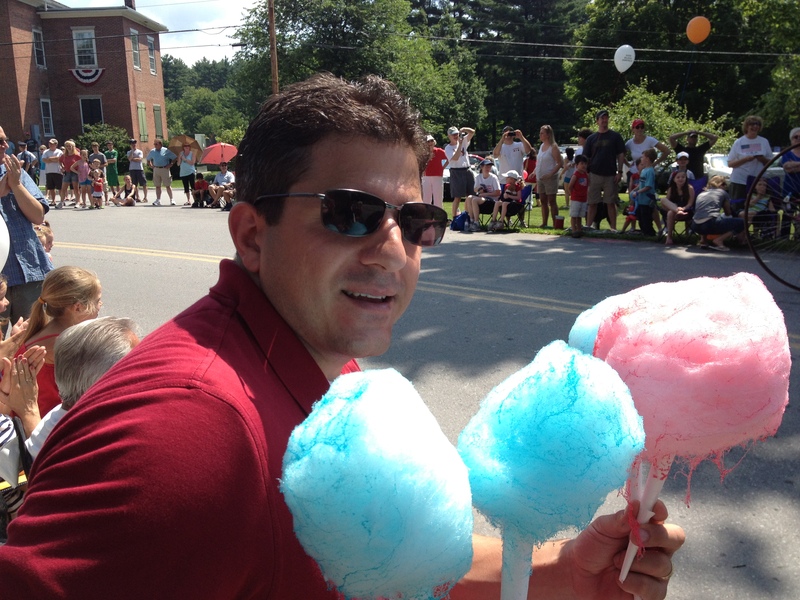 And so, on the morning of the 4th, nine Cariello’s in matching patriotic attire took in the Amherst Day parade. And, dare I say it, we had fun. Like the fireworks, we’ve come a long way from our first parade, where Jack howled and cried at the horses passing by, begging to go home. Now, thanks to Joe, Jack understands that the horses won’t bite him and when to expect the roar of the cannons. Afterwards we went back to the house and enjoyed a relaxing barbecue with Grandma and Grandpa. This year Rose collected stickers from the politicians and supporters marching in the parade and stuck them all over the pale pink walls in her bedroom. So far it looks like she’s voting for someone named Ovide, Kassan for Governor, and Obama. Also Mitt Romney. But in my heart, what I really meant was “Just great”. Love it! You’ll appreciate that my hubs loves the 4th—and I do too—but not to the extent that he does attire wise. For the past few years he has bought the boys matching American flag t-shirts and lamented that I didn’t have one as well! 🙂 He took so many pics of the boys on the beach waiting for the fireworks that they begged him to stop—just as I was about to! This was so great Carrie! Loved this one. Delightful reading! So funny and so real!